Ocean colour radiometry offers considerable potential for the observation of harmful algal blooms (HABs). HAB-related observations are often seen as high impact motivating factors for ocean colour and/or bio-optical components of coastal observing systems. However, this potential has not been fully realised for several reasons: the sizable uncertainties associated with ocean colour applications in the optically-complex coastal zone; observation systems not fully cognisant of the ecological role of the wide variety of potentially harmful algal blooms across global coastal ecosystems; and a lack of consolidated information regarding the suitability of available ocean colour techniques for HAB application to different ecosystems. The ocean colour and harmful algal bloom scientific communities would gain a great deal by identifying and addressing these issues. The combined IOCCG/GEOHAB Working Group, aims to produce a highly approachable “consumer’s guide” to ocean colour-based harmful algal bloom methods: objectively summarising the state of knowledge with regard to ocean colour and HABs; examining and demonstrating the suitability of various ocean colour approaches through bloom case studies from different ecosystems; and examining published and potential research and operational HAB applications. The ecosystem-specific nature of optimal ocean colour based HAB observations, the technical difficulties of using ocean colour in the optically-complex coastal zone, and the need to understand the limitations of ocean colour for deriving phytoplankton community composition will be primary focus areas. 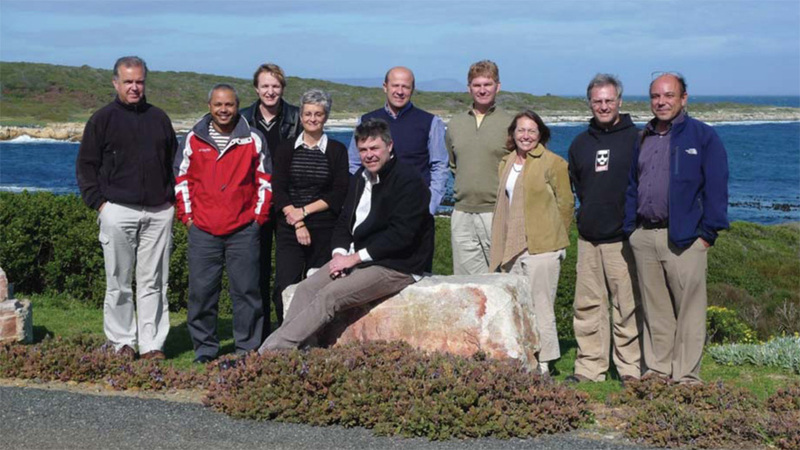 The first working group meeting took place in Cape Town, South Africa from 24 – 26 August 2010 and the second in Milan, Italy from 6-8 December 2011 (see reports under Working Group Documents, to the right). Summarise the relevance of ocean colour-based harmful algal bloom observation systems. Summarise the wide variety of harmful algal bloom types with regard to ecosystem function, consistent with GEOHAB Core Research structures. Summarise the principal methodological difficulties for ocean colour in coastal and inland waters, with reference to previous IOCCG Working Groups and other ongoing initiatives, e.g. GEO Tasks, CoastColour etc. Summarise our current understanding of the physics of phytoplankton community composition from a bio-optical and ocean colour perspective. Review the relevance of Phytoplankton Functional Type (PFT) approaches (with reference to the IOCCG PFT Working Group) for harmful algal bloom observations across a variety of coastal and inland ecosystems. Review and summarise current and emerging harmful algal bloom related ocean colour techniques, from reflectance-based community composition algorithms to ecosystem-specific change-detection algorithms i.e. research and operational applications. Compare the results of a variety of algorithms on selected bloom case studies, representative of the GEOHAB core research ecosystems with the specific addition of inland waters, and use these studies to provide a clear guide to ocean colour algorithm performance diagnostics, and optimal ocean colour-based approaches for various bloom and ecosystem types. Examine the utility of ocean colour observations beyond the event scale: multi-sensor and -temporal analyses of ecological drivers and response for example systems, analysing and demonstrating the value of routine synoptic data and integration with other observations and models. Recommendations concerning future studies, measurements, protocols etc. to develop, improve and better understand application limitations for HAB-focused ocean colour algorithms. Summary, recommendations and future outlook for the development of new ocean colour observation systems, incorporating future sensors/systems. Prepare a monograph to be published within the IOCCG or GEOHAB series. Prepare a special issue in a peer reviewed journal incorporating suitable review and case study chapters as papers.